Just wondering if it is possible to make your own maxi-pads? You purchased yours at quiet a initial cost but do you feel it would be possible to make your own from the template of the ones you purchased? I too have done most of what you have listed but can’t get hubby to use anything but tissues. Shoppers Drug Mart has them on sale each week and I am ashamed to say I spend about $3./week on tissues from hubby with allergies. I grew up in a Mennonite household where we used hankies. It was a treat to get one made from a friend. I still have these treasures and use them. Old nighties, receiving blankets and such are cut up and serged around to make the rag bin. I have a small Rubbermaid container of them which we use for washing to wiping grand children’s bums. They would be ideal for our #1 around here with three teenage daughters but put to a vote this morning…. answer. Nope! I remember the Eaton Catolgue and the outhouse. How life has changed but not always for the better. I really enjoy your blog. I too am doing work with making fancy Amish bread. A friend on the farm near Peterborough. Your ideas work well with me. Amazing! Do you have pics? Their pattern is simpler than the pads they sell commercially, but the videos seem very helpful. 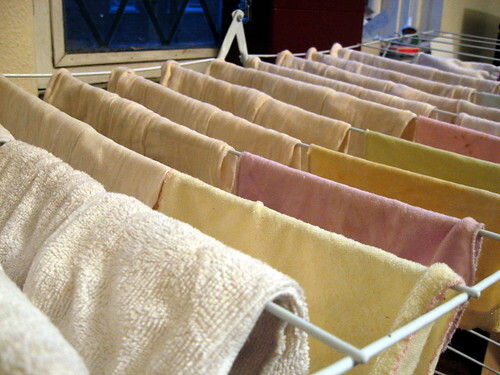 It sounds like you have lots of experience using cloth replacements Thanks for the comment! I’m still experimenting with the best methods to make them, but once I’m satisfied, I plan to add a tutorial – for the Czech women, because I don’t remember ever finding a tutorial in Czech! 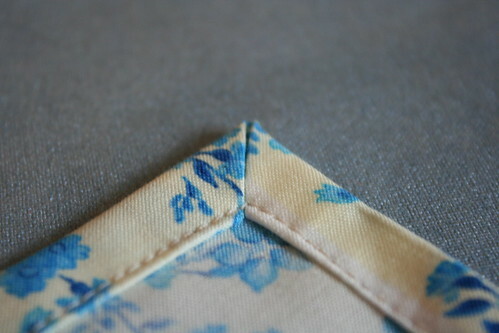 I would love to know how you get such beautiful napkin corners! I have tried many times and failed miserably. It took me a few tries, but accuracy in measuring seems to be key. I was pretty proud of them though! I am full of admiration for your cloth revolution! Most everything in our home is cloth rather than disposable except…. toilet paper. I am inspired by your description of using the cloth for no. 1’s however, that does seem do-able. All those fabrics with their variety of designs and purposes, create such a wonderful atmosphere of steady, simple living – I really really love it. Your photos are beautiful. We’ve used cloth napkins for many years and rags or microfibre rather than paper towel for a few years… recently switched to a Diva Cup and just today used “birthday money” to buy a few lunapads:) I do need to sew some new napkins too. The other ideas… well, I may need time to grow into them. I have been wondering if other moms offer lunapads to their teenage daughters and how this is received. Aww shucks! We’re so pleased to be mentioned on your blog. Thanks so much for sharing your experience with Lunapads with your readers. For those that are interested, in addition to cloth pads we also offer handkerchiefs and “family wipes” or reusable toilet paper. Here’s a coupon for 10% off on orders over $35 on Lunapads.com: just enter ‘clothrevolution’ at checkout to receive your discount. Thanks again Colleen, we couldn’t ask for better fans! Could you give the measurements for your cloth tissues? I am impressed with the lunapads. Funny that I can cloth diaper and deal with my kid’s poo but my own blood grosses me out. Will have to think more about this. 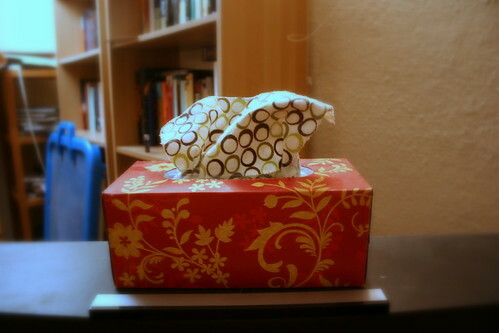 I’m curious how you made your “kleenex” box. I’ve made the exact same thing a few months ago, and I can’t seem to get a box heavy enough for me to be able to just pull out ONE sheet at a time and have the box stay when I pull. 😀 I’m glad you liked it! I just used a regular ol’ Kleenex box and stuffed the remaining kleenex down (I still have about 9 boxes left from a recent Costco trip!). All I did was fold my cloth tissues just like the kleenexes are folded, so that when you pull out one, it pulls out half of the next one. I will try to do a picture demo of this because it really is handy for keeping the wipes around the house (so we don’t forget and just use kleenex!). Now, to figure out a similar dispensing system for my toilet wipes! i have a friend who’s 8 year old daughter cant wait to get her period so she can have beautiful embroidered pads like her mum (she has plain ones which she embroidered little roses on). i have made my own set of pads in a basic pad shape, in varying thicknesses and lengths, all backed with polar fleece. the polar fleece is great, it helps them not move too much and nothing ever seems to soak through. i have got to make some cloth tissues. thats great! cloth for wees. not sure if we are ready yet. probably will be by the time we get our compost toilet tho. I love the cloth tissues. What an awesome idea. That you can wash them with what ever load your doing and hang them to dry on your laundry rack. What a great environmentally sound and money saving thing.